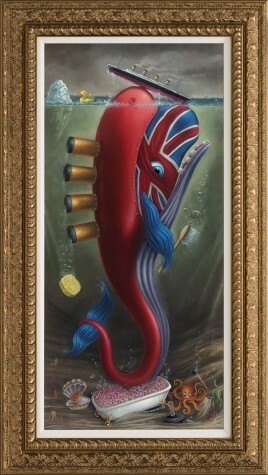 Titanicus Giganticus Britannicus, signed Peter Smith hand-varnished giclée on canvas. The world of Eccentricus Britannicus by Impossimal duo Peter and Jayne Smith may just be their most raucous release yet. One man’s quest to discover the secret behind a good old bubble bath leads to the iceberg-related disaster aboard the Titanic. Arthur Parsington-Pears, a hot-blooded Victorian explorer, purchases a first-class ticket before the Titannicus Britannicus – an underwater giant with his own penchant for bubble baths – pushes an iceberg in the British passenger liner’s way for a bit of peace and quiet. Image size 15" x 32"
Framed size 21.7" x 38.7"